The main point of interest in this double disc of re-releases is the 'completion' of Schubert's 8th Symphony by Brian Newbould. Professor Newbould has taken Schubert's sketches for the third movement Scherzo which were left in piano score along with two pages already completed in full score. The Trio had just one melody in the first section so some conjecture and speculation have been called for to go further. To this fleshing out he has added the B Minor entr'acte from Rosamunde as the fourth and final movement. - an ending to the symphony that has long had advocates. The Newbould conclusion has been recorded previously ( Marriner / ASM / Philips) and this recording helps to confirm it as a plausible option in one of music's great "what if''s". Charles Mackerras is a conductor who has never been reluctant to use the best of what period performance can offer yet without turning his back on the traditional, and here with an Orchestra dedicated to the period style and specialist instruments he is completely at home. There are some period specialists who seem to revel in extremes of tempi and their players can sometimes be heard to struggle to match the baton. 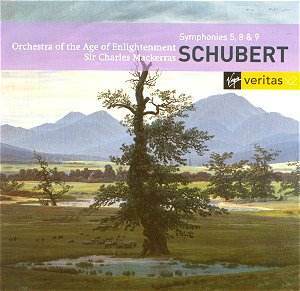 Here Mackerras sets a relaxed choice of tempi throughout and the OAE seem to revel in the choices he makes. There are two Schuberts to be heard in the Symphonies on the first CD. In the B Flat Major (No 5) we hear the sunny, genial composer, doffing his cap to Mozart, in a reading full of delights - Schubert the Charmer. The Unfinished shows considerable depth of emotion and passages that point to the composer's hidden turmoil. The distinctive sounds that the older instruments make are a gain, less bland and homogenised than their modern counterparts and they benefit from a good, clear recording. The filler - Rosamunde Ballet Music 2 is a delight. The "Great" C Major on CD2 - a work that has many, many opinions expressed about it from the sleeve-note writer's dream quote - "Heavenly Length" (Schumann) to G.B.S's put-down " A more exasperatingly brainless composition was never put on paper". It is a work frequently recorded, often with great success (a personal favourite is the Boult / LPO version on EMI - old fashioned, perhaps, but so convincing). All the repeats (which prompted Shaw's remark) are included and the tempi controlled but lacking the final degree of spring in the step at times. Even more than earlier, the period sounds are a distinct plus point - especially the brass which make a splendid impact against strings that have less weight than today's instruments. Recommended listening - you do not need to be a period performance devotee to enjoy it.